“5th International Conference on 3D Printing Technology and Innovations” during March 16-17, 2020 in Berlin at Germany, which includes prompt keynote presentations, Oral talks, Poster presentations and Exhibitions. 3D Printing also known as Additive manufacturing. It turns digital 3D models into solid objects by building them up in layers. The technology was first invented in the 1980s, and since that time has been used for rapid prototyping (RP). However, in the last few years, 3D printing has additionally started to evolve into a next-generation manufacturing technology that has the potential to allow the local, on-demand production of final products or parts thereof. This technology is used in the fields of jewellery, footwear, industrial design, architecture, engineering and construction (AEC), automotive, aerospace, dental and medical industries, education, geographic information systems, civil engineering, and many others. Who should attend 3D Printing Conference 2020? Conferences and meetings is the only platform we can learn and exchange the knowledge. Scientists, Engineers, Directors of companies, Researches from different parts of the world come and meet at one place to share views, exchange knowledge and establish research collaborations & networking in the field of 3D Printing Technology & Innovations. Why to attend 3D Printing Conference 2020? 3D Printing Conference 2020, Berlin, brings an Opportunity to attend the presentations delivered by eminent scientists, researchers, experts from all over the world and Participation in sessions on specific topics on which the conference is expected to achieve progress. It brings Global networking in transferring and exchanging Ideas. Share your excitement in promoting new ideas, developments and innovations in the field of 3D Printing Technology & Innovations. 3D Printing 2020 is the leading B2B trade show for the 3D printing industry. As an attendee, you’ll explore the business applications of 3D printing through our conference sessions, hear keynote presentations from industry influencers, add valuable contacts to your network, and watch the latest 3D printers and services in action. 3D printing is a form of Additive manufacturing is a process of making three dimensional solid objects by laying down successive layers of material from a digital file. It is also known as rapid prototyping. According to Standard Terminology for Additive Manufacturing Technologies, The American Society for Testing and Materials (ASTM) group “ASTM F42 – Additive Manufacturing” developed a set of standards that classify the Additive Manufacturing processes into some categories. 3D Printing has been applied in medicine since 2000s. For manufacturing of custom pros-thetics and dental implants it was first used and then onwards the medical applications for 3D Printing has evolved significantly. By the use of 3D printing we can produce exoskeletons, windpipes, jaw bone, bones, ears, blood vessels, vascular networks, tissues, eye-glasses, cell cultures, stem cells and organs. The current medical applications of 3D Printing can be categorized into a number of categories that are creating im-plants, tissue and organ fabrication, prosthetics and pharmaceutical research concerning drug discovery and anatomical models. A wide range of materials can be utilized for 3D printing, for example, ABS plastic, PLA, polyamide (nylon), glass filled polyamide, stereo lithography materials (epoxy gums), silver, titanium, steel, wax, photopolymers and polycarbonate. The materials accessible for 3D printing have progressed significantly since the beginning of the innovation. There is presently a wide assortment of various material types, which are provided in various states. Particular materials are now generally produced for particular stages performing dedicated applications with material properties that more precisely suit the application. The energy around the promise of 3D printing has opened the floodgates. New printers are being created each day to print a wide range of materials from plastics, metals, composites, and cement, to organic materials, paper, and food. 3D printing, or additive manufacturing, has been the concentration of some solid talks in the manufacturing industry in the most recent couple of years. While the idea of 3D printing has been around for some time, new progressions in the innovation have begun to bring down the cost of the procedure to levels that make it more achievable for general manufacturing use. The procedure of utilizing specialized equipment to gather an object layer by layer has some one of a kind and fascinating points of interest over traditional manufacturing. 3D bio printing is the process of making cell designs in a bound space utilizing 3D printing technologies, where cell capacity and suitability are saved inside the printed build. 3D bioprinting contributes to huge advances in the medical field of tissue engineering by taking into account research to be done on inventive materials called biomaterials. Biomaterials are the materials adjusted and utilized for printing three-dimensional articles. Some of the most prominent bioengineered substances are normally stronger than the normal real materials, including soft tissue and bone. These constituents can act as future substitutes, even upgrades, for the original body materials. 3D Bio printing is the way towards making cell designs in a restricted space utilizing 3D printing technology, where cell capacity and viability are saved inside the printed build. 3D bioprinting adds to huge advances in the medicinal field of tissue engineering by allowing for research to be done on innovative materials called biomaterials. In bioprinting, there are three major types of printers that have been utilized. These are inkjet, laser-assisted, and extrusion printers. 3D Bio printers are streamlined to have the capacity to print skin tissue, heart tissue, and veins among other essential tissues that could be appropriate for surgical treatment and transplantation. 3D Printing is moving in several directions as of now and all signs are that it will keep on expanding in numerous ranges later on. The absolute most encouraging zones incorporate medical applications, custom parts substitution, and customized buyer items. As materials enhance and expenses go down, different applications we can barely imagine today will become possible. Research and technology development in 3D image processing and visualization envelops an expansive range of activities. Based on the in-house center innovation of object triangulation with the capacity to control both the blunder of estimate and the quantity of triangles, four classes of complementing activities, reveal the broadness and imperativeness of this R&D motivation. Polymers are macromolecules made of many rehashing subunits called monomers. These monomers are coordinated by covalent bonds where atoms share electrons being a strong union. The procedure to deliver a polymer is known as polymerization reaction. Thermoplastic polymers are really important in Additive Manufacturing. Thermoplastics are polymers which relax when they are warmed and harden as they cool. These polymers are utilized for plastic 3D prints, prominently Selective Laser Sintering (SLS). There are a few prominent thermoplastics that can be utilized with this procedure, delivering a variety of results depending on their base properties. Tissue and Organ failure is brought on by aging, illness, accidents, and birth defects. The present treatment for these failures is replacement from a living or expired Organ/Tissue Donor. Three-Dimensional Printing, or "stereo lithography", is the way toward keeping materials in layers to shape 3D objects. "Bio printing" includes the utilization of modified 3D printers, empowering them to print natural materials. Progressions in this technology, alongside biomaterials, will enable a patient's own cells to be utilized to build replacement tissues and organs for those in need. The ordinary procedure for bio printing 3D tissues and organs includes: Imaging, Design approach, Material/Cell determination, Printing, and Application. Imaging of the earth of the harmed tissue is useful in the outline procedure, and includes the utilization of X-ray, CT scan, and MRI imaging. Minitissues are the smallest auxiliary and functional components of a tissue, similar to a kidney nephron. These are utilized as a part of both "Biomimicry" and “Self-assembly” strategies. The test of actualizing 3D printing with Organ and Tissue building is taking innovation intended to print liquid plastics and metals, and adjusting it to a procedure that prints delicate, living, natural materials. The origin of 3D printing in 'Rapid Prototyping' were established on the standards of Industrial prototyping as a method for accelerating the earliest stages of product development with a quick and clear method for creating models that allows for multiple iterations of product to arrive more rapidly and effectively at an optimum solution. This saves time and cash at the beginning of the whole product improvement process and guarantees certainty in front of production tooling. Industrial 3D printers are better than consumer-grade 3D printers for manufacturing completely working, quality models. The best business 3D printers have extensive print capacity, choice determination and utilize to a great degree tough materials. 3D Printing applications cover different segments from education to industry, and the entire value chain from models to extra part management. The biggest challenges of 3d printing we’ve heard over the years and throughout the industry including Equipment costs, Limited materials available, Post-processing requirements, Manufacturing costs, Lack of in-house additive manufacturing resources, Lack of expertise and/or training among workforce/employees, Limited repeatability (accuracy from build to build), Lack of formal standards, Lack of proven documentation of additive manufacturing’s capabilities, Software development and capabilities, Longer production timelines, Limited recyclability, Risk of litigation/legal implication, Data storage requirements and others. Enduring the physical and mental results of having a cancer diagnosis is only the beginning of the battle. Cancer patients then need to manage difficult treatment cycles and related side effects. The high measurements of radiation used to destroy tumour cells can likewise harm neighbouring healthy tissues. Although major improvements in radiation technology, for example, intensity modulated radiation therapy have led to reduced toxicity, these techniques have a tendency to be complex requiring a few arranging steps and security checks before the patient can begin treatment. 3D printing is promising to take care of some of these issues and help in providing personalized cancer treatment. 3D printing also called as additive manufacturing technology where a three dimensional object is made by setting down progressive layers of material. It is otherwise called rapid prototyping. It is an automated technique whereby 3D objects are rapidly made on a sensibly estimated machine associated with a PC containing blueprints for the object. The 3D printing Market is required to achieve USD 30.19 Billion by 2022, at a CAGR of 28.5% somewhere around 2016 and 2022. The market has been sectioned on the premise of printer, material form, material shape, process, technology, software, service, application, vertical, and geology. 3D printing is currently used to make complex parts, models (quick prototyping), and little arrangement segments. Streamlining of creation work process through computerized generation instruments, powder taking care of and reusing capacities, and mobile production controls is filling the interest for industrial printers. The base year considered for this report is 2015 and the figure time frame is from 2016 to 2022. 3D printing has played an important role in transforming the supply chain over the previous decade. Its recent sparkle in the general population eye is yet a flash contrasted with the impact of the technology has in the background on the production floor. It is affecting each phase of the product development lifecycle, from the product itself to packaging, presentation, conveyance—and so on. In all the buildup, it can be hard to remove the substantial benefits of the technology from the dreamy, more futuristic tales. The real differences 3D printing is conveying to the supply chain exist in five key territories. 3D Printing an Unexpected Technology where architects get Shocked…! 3D Printing -2020 welcomes attendees, presenters, and exhibitors from all over the world to Berlin, Germany. We are pleased to welcome all of you to attend and register for the “5th International Conference on 3D printing Technology & Innovations” (3D Printing -2020) which is going to be held during March 16-17, 2020 in Berlin, Germany. 3D Printing- 2020 is an International Conference focusing on sustainability concept implemented in design and construction of 3D materials in industries. It also discusses various advantages and innovations in all sectors. We welcome you to join along with us at the 3D Printing -2020, where you will make sure to have a significant involvement with researchers from around the globe. All the individuals of 3D Printing-2020 organizing committee look forward to meet you in Berlin, Germany. It is estimated that the overall market for 3D printing will have developed to around 15.9 billion dollars before the end of 2016. 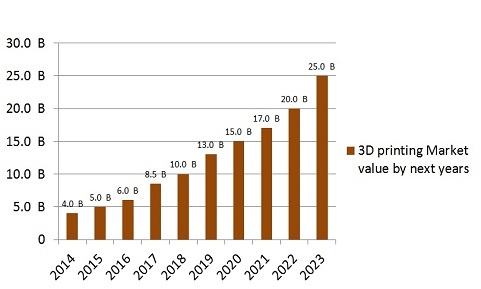 The 3D printing business sector is relied upon to achieve USD 30.19 Billion by 2022, developing at a CAGR of 28.5% somewhere around 2016 and 2022. As indicated by the IDC experts, worldwide incomes for the 3D printing business sector will detonate to a gigantic $35.4 billion by the year 2020. With 2016 revenue it is anticipated that it would reach $15.9 billion that implies the business will be doubled in the following five years. Generally speaking the compound yearly development rate for the worldwide market amid their 2015 through 2020 estimate period is an amazing 24.1%.The world 3D printing market has been sectioned in view of segment, application and geology. In view of part, the market is characterized into innovation, material and administrations. 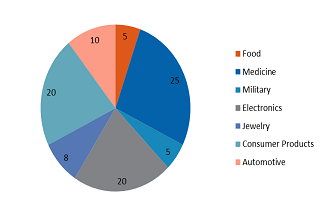 Worldwide market for 3D printing material incorporates polymers, metals and earthenware production. Also, 3D printing offers a wide exhibit of uses in different enterprises, namely consumer products, industrial products, defence & aerospace, automotive, healthcare, education & research and others. 3D printing materials have impressive growth in Middle East regions. Various 3D printing manufacturing companies have witnessed setting-up in the Middle East regions during the last few years. It’s showing that the trend is likely to continue over the next 10 years with the availability of low cost raw materials along with increasing manufacturing output in these regions. Middle East 3D Printing Materials market value is anticipated to expand at a CAGR of 16.7% during the forecast period and along with that the Middle East 3D printing materials market volume is expected to register a CAGR of 11.2% during the forecast period. 3rd International Conference on 3D Printing Technology and Innovations was held in Rome, Italy, during March 25-26, 2019. 3D Printing 2019 witnessed an amalgamation of peerless speakers who enlightened the crowd with their knowledge and confabulated on various new-fangled topics related to the field of 3D Printing. The highly exalted conference hosted by Conference Series LLC Ltd was marked with the attendance of renowned and brilliant researchers, business delegates and talented student communities representing more than 20 countries around the world. The conference has tried grounding every aspect related to 3D Printing, covering all the possible research areas and crux. The conference aimed a parallel rail with theme “Showcasing the future of 3D Printing in Engineering and Medicine”. The meeting engrossed a vicinity of cognizant discussions on novel subjects like Advances in 3D Printing & Additive Manufacturing Technology, Innovations in 3D Printing, Design for 3D Printing, 3D Printing Materials, Benefits of 3D Printing and Technology, Future Technology in 3D Printing, Challenges in 3D Printing, 3D printing in Biomaterials, Clinical applications of 3D Printing Innovations, Applications of 3D Printing in healthcare & medicine, 3D Printing Technology Impact on Manufacturing Industry, 3D Image Processing and Visualization, 3D printing technology and innovations, Metal 3D Printing, Polymers in 3d printing, 3D Bio printing, Lasers in 3D Printing in Manufacturing Industry, 3D Printing of Supply Chain Management, Tissue and Organ Printing and other allied areas of 3D Printing. The conceptual and applicable knowledge shared, will also foster organizational collaborations to nurture scientific accelerations. The Organizing Committee would like to thank the moderator Martin Mapley, Griffith University, Australia for his contribution which resulted in smooth functioning of the conference. A series of invited lectures by the members of the Keynote Forum marked the commencement of the event. Prominent speakers like Miroslav Piska from Brno University of Technology, Czech Republic, Soshu Kirihara from Osaka University, Japan, José L Ocaña from UPM Laser Centre - Polytechnic University of Madrid, Spain, Jean-Marc Frances from Elkem Silicones, France, Lombardi Mariangela from Politecnico di Torino, Italy, Srdjan Milenkovic from IMDEA Materials Institute, Spain, A Errachid from UMR 5280-Institut des Sciences Analytiques, CNRS, Université de Lyon, France, Martin Hannibal from University of Southern Denmark, Denmark, Andrew J Kobets from Children's Hospital at Montefiore, USA, Konrad Gruber from Wrocław University of Science & Technology, Poland, Patrycja Szymczyk from Wrocław University of Science & Technology, Poland, Marina Cabrini from University of Bergamo, Italy, Teresa Russo from Institute of Polymers, Composites and Biomaterials - CNR, Italy, Maredi E from University of Bologna, Italy, Katrin Buckova from Brno University of Technology, Czech Republic, Arnautov A from NUST “MISiS”, Russia, Krzysztof Kanawka from Blue Dot Solutions, Poland, Sahar Sultan from Stockholm University, Sweden, Seong-Woo Woo from Reliability Association of Korea, South Korea, Farhang Momeni from University of Michigan-Ann Arbor, USA gave their fruitful contributions in the form of highly informative presentations and made the conference a top notch one. Conference Series LLC Ltd is prerogative to thank the Organizing Committee Members, Keynote speakers, Chairs on transcribing the plenary sessions in a diversified and variegate manner to make this conference an enviable artefact. Conference Series LLC Ltd 3rd International Conference on 3D Printing Technology and Innovations would not have reached the pinnacle if not with the support of International, multi-professional steering committee and coordination of the International Journal of Advancements in Technology, Journal of Material Sciences & Engineering, International Journal of Advance Innovations, Thoughts & Ideas. Hence, we express our deep sense of gratitude. “5th International Conference on 3D Printing Technology and Innovations” which is going to be held during March 16-17, 2020 in Berlin, Germany” with the theme “Exploring new technologies and Innovations in 3D Printing”.